We are back in Uganda for a short trip. No sooner are we unpacked than I am packing to come home again. Our home here felt really quiet on our arrival, but then the school term ended and eleven children arrived to join our A level student Amos. 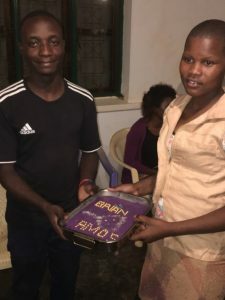 Over the last few months we have been trying to help Amos finish his education. It was a struggle for him to remain in school studying for A levels, when he was over the age of 20. He missed several years of school attendance due to lack of school fees when he was younger, which of course meant that he finished later too. Still, he has just completed his exams and is moving on, probably to join his family in Kenya. We had a party yesterday to celebrate him, and what a wonderful young man he is. Each child/young person is unique in so many ways. Among other things this young man is a comedic actor, and also took on the job of clambering on our roof to clean the solar panels when necessary. He is a bit of an entrepreneur, and we are sure he will do well. Gentle, thoughtful and kind, the younger boys will miss his humble nature and friendly camaraderie. A real big brother who will stay in touch. We baked Amos a cake, and ate the best Ugandan meal I have ever had. Everyone pulled out all the stops. We gave him a bible, and a gift, and prayed for him. All of us gave one sentence of advise, and it was really sweet to see the smaller kids telling him to be good, travel safely and love God. Noah (our operations manager) finished by telling him to respect himself, respect others, and to respect God. The kids fell silent and there were one or two tears pricking the backs of our eyes. Another cake and small gift appeared for Priscilla. We were blessed with several young people when we helped another organisation when the leaders, Robyn and Jim returned to the USA. Amos and Priscilla are the remaining two. Amos made us smile when he said the kids had always betted that Priscilla would be the last to leave. Priscilla is our lead Social Worker, and had just graduated from a diploma in IT She has long since stopped being our “child” and is now a major part of our team. Seemed so fitting that they shared the celebration. Goodbye Amos. We wish you well, and we bless Robyn and Jim for entrusting him to us. During the day I had, with Susan, met a young lady who needed a home. A wonderful lady brought her, and will stay in touch, but could not accommodate her. She needs a safe home, and to join Senior school year 2. We decided we could help this lass, and she has moved in with the girls, and will attend our secondary school in the new school year (Feb.). Such a busy day meeting with people that I may have glossed over the finer details of accepting her into the family. After the party as we were hustling the kids towards the minibus (don’t ask how many went in it) a hand touched my arm and a quiet voice said “where will I sleep tonight?”. I need to brush up on my communication skills. That day we also agreed that a 15 year old boarding student could be offered a home in the holidays too. There are so many reasons that a teenage girl needs a safe home, and we were pleased to accommodate her. Both young ladies need sponsorship, and as usual we have done things backwards, letting our hearts rule our heads…trusting that God will provide for the youngsters He lays on our hearts. The major reason for this short trip was for Alan to help the accounts department to get completely up to date to file our accounts with the Uganda Revenue Authority. If you recall previous ramblings, you will understand the relief we all feel that after pulling very long hours Alan and Lydia (Admin manager) managed to file the accounts. That deserved huge celebrations, but there was no time to celebrate as we left for the airport in the morning. We often ask folk to tell us 3 good things that have happened since we last saw them. We have a new lady who is looking after our house for us. I cannot recall the 2nd and third thing she said because I lost it after she happily said “I have become fat”. We are very close to a couple of missionary families who invite us to their pot-luck suppers. Newly landed and without our kitchen fully up and running we did not contribute, but we were in great danger of increasing our girth as our fabulous friends take up the challenge of producing a feast with limited ingredients. I have to note that our town lost a real-life saint this week. 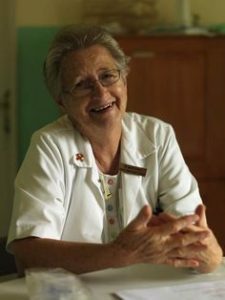 Doctor Maura was an amazing Catholic Sister and surgeon who for many years lead the catholic hospital in the town. She trained surgeons, and inspired everyone she met. A fierce, strong woman she completed 50 years of selfless service in Uganda. We left town today so were unable to attend her burial, but she will long be remembered by very many, some of whom owe their lives to her. If you are interested in things medical, Dr Maura pioneered VVF surgery in Uganda, and even opened a VVF ward in Masaka. Saving hundreds of young women from a lifetime of suffering and shame. Dr Maura Lynch became blind in one eye, but kept serving both the community and her Lord. Loss of sight did not mean loss of vision. She saw solutions where others only saw problems. We pray that the memory of this very human, very humble lady will long give glory to the God who so inspired her. Google Dr Maura Lynch Masaka VVF for more. It was a week of comings and goings, of goodbyes and welcomes. We are now looking forward to Christmas when we welcome the One who came to bring light to the darkness, and whose name and deeds are also remembered. “And he (Jesus) will be called Wonderful, Counsellor, Mighty God, Everlasting Father, Prince of Peace.” Isaiah 9 verse 6 The Bible. Happy Christmas everyone and a blessed New Year.